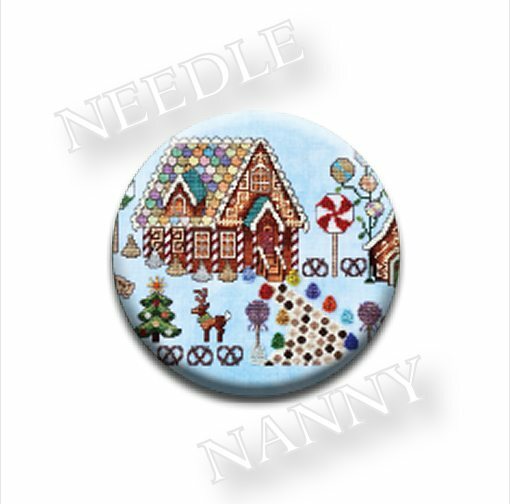 This particular Needle Nanny is produced from the original Glendon Place design GP-239 Gingerbread Grove. A Needle Nanny is a useful magnetic crafting tool featuring two powerful magnets. The Needle Nanny’s magnetic back is removable, allowing it to be placed directly on a project or worn as a pin. Each Needle Nanny is 1 inch in diameter, with rounded edges and a smooth back so that it won’t leave snags, pulls or residue on your fabric. Multiple designs make them fun to collect and use.